When it comes to winter time riding, there's no denying that you need to balance protection with warmth. FXR’s FX-1 Team Helmet with integrated full shield provides the perfect combination. The tough lightweight Thermoplastic shell fits comfortably with a dual density EPS liner that is soft to the touch yet firm enough to properly support and keep the helmet in place. The front chin bar is designed to accommodate a breath box or anti-fog mask and a sliding louver effectively manages the task of venting the helmet. 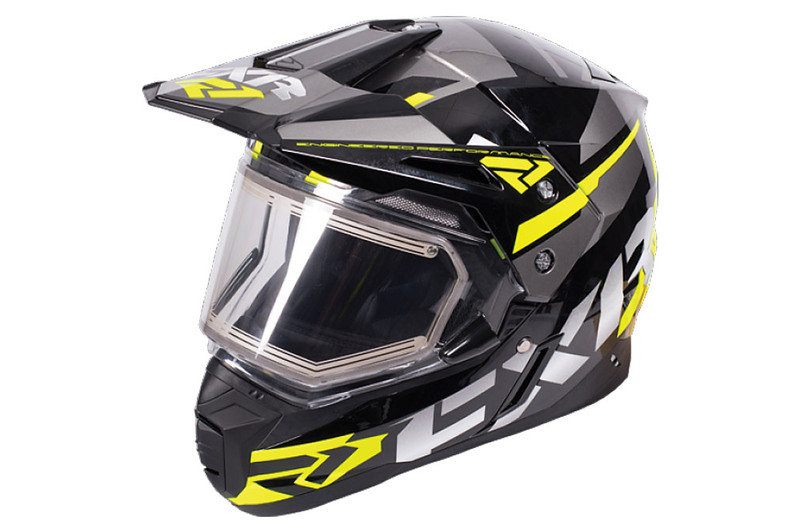 Key to the design of the FX-1 helmet is its dual sport designation making it perfect for a helmet being used with goggles during the summer time or colder conditions with full shield. Available shields are the standard non-electric shield which features UV protection along with Anti-Fog and Scratching protection or an electronically heated shield offering the same UV and scratch protection but enhanced anti-fogging qualities and the benefit of radiant heat keeping your face warmer as well.